Lyle, the popular Australian, only got in the field that year as an alternate after Harrison Frazar withdrew. Lyle was completing his second round that morning, as the tournament had been delayed by frosty conditions and wouldn’t finish until Monday. He was wearing a light-green shirt and a darker green Titleist hat on that memorable day. He pulled his 8-iron and took aim. Lyle knew he’d hit it well—obvious from a little club twirl at the finish—and motioned with his hands for ball to get down. It did. The ball hit the green, took a big hop, a smaller hop and a short roll into the cup. Doctors diagnosed Lyle with leukemia when he was 17, and he battled it for more than two decades. He beat the disease the first time and earned his PGA Tour card in 2007 then won twice the next season on the Web.com Tour. The cancer returned in 2012, but he beat it again and played 42 tournaments. A recurrence was diagnosed in 2017 and Lyle fought valiantly for a year, even enduring a bone marrow transplant, before deciding to end treatment and begin palliative care. He died Aug. 8, 2018. 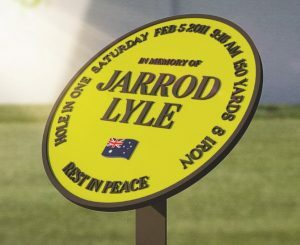 Phoenix is the latest event to do something special as a memorial to Lyle. Officials at last year’s Wyndham Championship, the last PGA Tour event in which he participated, in 2016, created a display on the first tee to honour the Shepparton native. Players and caddies received yellow hats, and many chose to wear them during the tournament. Players wore yellow ribbons in his honour during the ensuing World Golf Championships-Bridgestone Invitational and PGA Championship. Rickie Fowler even changed his wardrobe to wear a bright yellow shirt at the PGA Championship in honour of Lyle then wept after the round when talking about his friend. Players contributed en masse to a fund that was set up to provide for Lyle’s two young daughters.